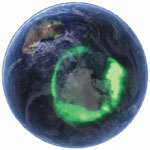 The mystery behind the faint glow of light in the earth’s upper atmosphere, known as diffuse aurora, has been revealed. A special kind of radio wave, chorus wave, causes aurora. The waves scatter electrons trapped in space and dump them in the atmosphere to create diffuse aurora. Aurora varies according to the season and 11-year solar cycle. The revelation can benefit satellite, power grid and the aviation industry by improving GPS navigation. Famous for ice and penguins, Antarctica may once have been lush rainforest full of animal life. Turtle fossils, 45 million years old, discovered from Seymour island suggest that the region had high turtle diversity. The bones, only two fragments from its shell, are the first of their kind to be discovered in the region and are not linked to any species known to live during the Eocene Epoch. Ever thought soft drinks that have been incriminated in parts of the world for carcinogenic content can help fight cancer? At least researchers from Indianapolis believe they do. They found that a lemon-lime soft drink could improve the effectiveness of an oral anti-cancer drug. They conducted tests with an artificial stomach and found that it absorbed more of the unnamed drug when taken with degassed Sprite. The effectiveness of drugs declines due to variations in stomach acidity; Sprite controls it. 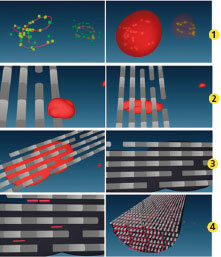 Scientists have mimicked the process of bone formation in the laboratory. 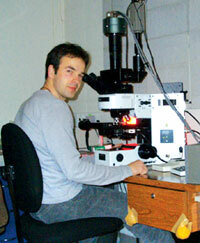 A cryoTitan electron microscope was used to capture the formation process in visual detail. Bone forms naturally when calcium phosphate nanocrystals are deposited on collagen fibers — which is just what the researchers initiated in the lab. It has long been assumed that collagen only acts as a template for bone formation, with the actual process occurring due to the presence of specialised biomolecules. What the scientists discovered, was that the collagen fibers themselves control mineral deposition and thereby bone formation. The biomolecules serve to keep the calcium phosphate in liquid state until mineral growth starts. The microscope rapidly froze samples at various stages of mineralisation. This allowed the scientists to document the procedure in steps. With a genome of more than 700 kilobases, a newly discovered virus happens to be the first giant virus to infect marine organisms. It is the second largest virus ever found. Its genome has genes not found in other viruses, supporting claims that viruses had a critical role in the evolution of life. Dubbed CroV, it has been isolated from microzooplankton Cafeteria roenbergensis. They are major consumers of heterotrophic bacteria and phytoplankton and critical for balance of food webs. Set copper aside and let light be the new carrier of information. Duke University engineers have designed microscopically small lasers integrated with thin film-light guides on silicon which could replace copper in electronic products. Just as fibre optics can carry more information than copper cables, optical signals within circuits can step up the amount and speed of data transmissions. The optical structures on silicon contain tiny light-emitting lasers, and also connect these lasers to channels that accurately guide the light to its target— another nearby chip or component. 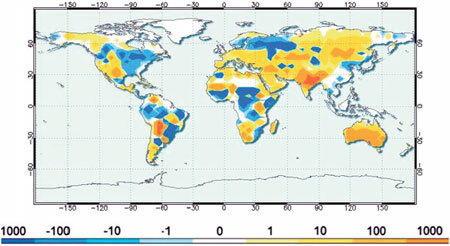 Recent increase in wildfires worldwide is cause of worry. Using fire and climate modelling, combined with land cover and population estimates, scientists have produced a global fire activity record. They predict five per cent increase in wildfire incidents by 2100. Large increases will be seen in India, Australia, central Asia, Siberia, southern Europe and Africa. There will be significant decreases in fire incidents in northern Europe, equatorial Africa and South America because of increased precipitation in these areas. 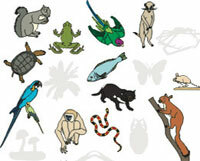 A fifth of the world’s vertebrates are facing extinction because of human encroachment on forests. A study used data for 25,000 species from The IUCN Red List of Threatened Species to arrive at this conclusion. It found that 25 per cent mammals, 13 per cent birds, 22 per cent reptiles, 41 per cent amphibians, 33 per cent cartilaginous fish and 15 per cent bony fish are threatened. The decline would have been 20 per cent more if there were no conservation efforts. Men should think twice before they munch on chips and burger. A study conducted on rats shows that men who eat a high fat diet before conception are likely to produce daughters with abnormal insulin-producing beta cells. It is the first study on any species to show that a fathers’ nutritional legacy reaches next generation. Till now, it was believed that only women’s diet affects the child. For the study, male rats were fed a high-fat diet, and were 20 per cent heavier when they mated. The daughter rats weighed normal but developed diabetes as young adults. People often doubt eco-friendliness of compact fluorescent lamps (cfls) because they contain mercury. Now a research indicates that when everything from manufacturing processes to electrical power sources to disposal methods are considered, cfls are the winners. Scientists at the Swiss Federal Laboratories for Materials Science and Technology studied life-cycle analyses of four different lamps: the classical incandescent bulb, halogen lamps, fluorescent tubes and CFLs. They found the impact of CFL mercury on the environment, even if it is recycled and not incinerated, is minimal compared to the pollution caused by coal-burning power plants. An incandescent bulb is more eco-friendly than a CFL during the first 50 hours of use. After that CFL’s energy-efficiency works to its advantage. This advantage grows considerably due to the comparative lifespan of both bulbs: about 10,000 hours for a CFL compared to around 1,000 hours for a standard incandescent bulb.